Add a classic touch to your dining room with this GET M-814-L SuperMel 2.9 qt. dynasty longevity bowl. 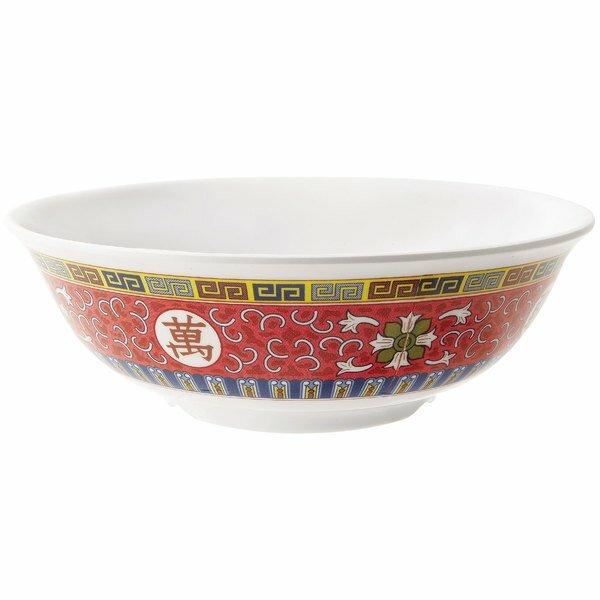 This bowl is the perfect size for serving hardy soups, pastas, salads and more. Its distinctive pattern also provides an attractive presentation to enhance your dining room. Best of all, made from melamine this bowl is lighter and more sturdy than traditional china, making it an economical choice for your food service operation. GET Enterprises provides customers with stylish and durable products, and the crack- and chip-resistant melamine construction of this piece ensures long-lasting use. The virtually unbreakable form also makes this collection ideal for outdoor dining areas, catered events, or anywhere that safety is a concern. Additionally, this bowl features a footed bottom to help promote air flow when it's stacked. No matter the occasion or venue, this GET SuperMel bowl is sure to easily complement your dining area!